The Shanghai Science and Technology Awards Conference was held in the morning of March 23 in the Friendship Hall to celebrate the outstanding contributions and innovations in science and technology from the awardees. 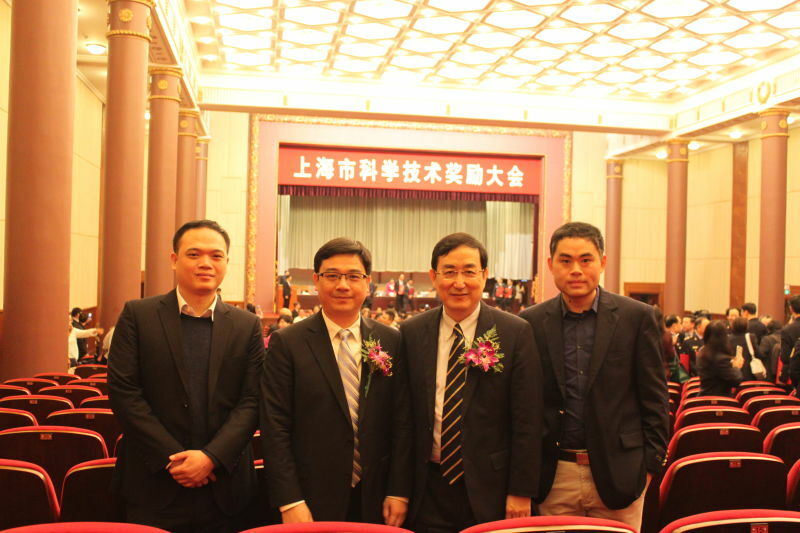 Dr. Wang Xi, a member of the Chinese Academy of Sciences, was honored as a “Hero of Shanghai in Science and Technology”. The silicon photonics team from SIMIT won the First Prize in Natural Science in Shanghai for their work on “On-chip optical nonreciprocity, sub-diffraction-limit resolution and large-scale silicon photonic integration”. On the morning of March 23, Shanghai Science and Technology Awarding Conference was held at Friendship Hall, grandly commending the science and technology researchers who had made great contributions to the science and technology innovation of Shanghai. The conference awarded Academician Wang Xi Shanghai City Great Contributor for Science and Technology. 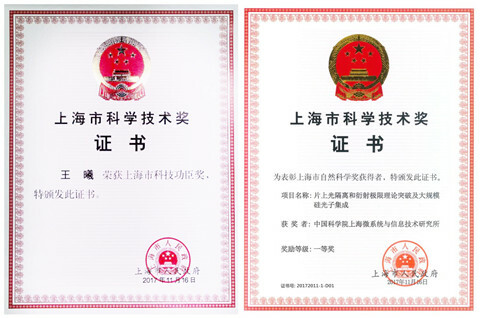 SIMIT silicon photonics team was awarded First Prize of Shanghai Natural Science Award for their "on-chip optical isolation, theoretical breakthrough of diffraction limit and large-scale silicon photonics integration". Academician Wang Xi from SIMIT has long been dedicated to the study on the physical phenomenon of interaction between the energetic ion beam and the solid and applied to SOI (silicon-on-insulator) development. The institute also established the only SOI material developing and producing base--Shanghai Simgui Technology Co., Ltd. The company led the team in developing ultra-low-dose SOI technique and created Simbond-SOI technology with proprietary intellectual property rights. The team successfully realized the industrialization of 8-inch SOI materials which were imported to western developed countries. They realized the great-leap-forward development for our national microelectronic materials. In addition, the team also resolved the demand for SOI products for spaceflight electronic devices, greatly contributing to the self-controlling of core components for our country. Academician Wang Xi greatly promoted a group of Shanghai semiconductor major projects, and the 12-inch integrated circuit silicon chip project was expected to fill up the blank of large silicon chip industry for our country. The magnetic storage device and silicon photon project brought about the innovated thinking for the future differentiated development of microelectronic technology in Shanghai. SITRI that was committed to the technology innovation to "eBeyond Moore" has already been established, which became the supporter for Shanghai to build up a global technology center. The team behind the project of "On-chip optical nonreciprocity, sub-diffraction-limit resolution and large-scale silicon photonic integration”consists of five researchers from SIMIT: Drs. Gan Fuwan, Wu Aimin, Li Wei, Qi Minghao and Wang Xi. The team proposed an interdisciplinary approach that took advantages of both microelectronics and optoelectronics to break the two bottlenecks in integrated circuits: speed and power dissipation. They made significant contributions in manipulating optical beams below the diffraction limit, on-chip light sources, passive optical non-reciprocity and large-scale photonic integration. Part of the research output has been commercialized, paving the way to large-scale deployment of silicon photonics in high-speed telecommunications and optical interconnects.